The image above to the left depicts the structure of the cellulose biopolymer. The hero of this case study is our client Aptissen SA. This client researches, develops, manufactures and commercialises biopolymer-based medical devices. “Aptissen” stands for Advanced Polymer for TISSue ENgineering, which unveils the company’s skills. These skills have been built over an 11 years period within the Healthcare division of the Swiss company Anteis SA. The acquisition of Anteis SA (innovative injectable medical devices) by Merz Pharma (November 2013) gave Anteis’ founders the opportunity to spin off its Healthcare division and found Aptissen SA. Aptissen’s products relieve patients in the field of Ophthalmology, with surgical solutions for glaucoma, and in the field of Orthopaedics, with innovative treatments for osteoarthritis. A polymer (Greek poly-, “many” + -mer, “parts”) is a large molecule. Biopolymers are elements that occur in nature. Cellulose is the most common organic compound and biopolymer on Earth. About 33 percent of all plant matter is cellulose. The cellulose content of cotton is 90 percent, while wood’s is 50 percent. Scientists and commercial entities are increasingly looking at biopolymers as an opportunity to commit to resource conservation, environmental preservation, and sustainable technologies. Back in July 2014, Aptissen was actively searching for a new warehouse facility to stock their merchandise at a guaranteed temperature of between 2° and 25° C.
A contractual deadline. Imperative: Speed (Aptissen’s current contract terminated end October 2014). Swissmedic certified services. Imperative: indispensable. High performing and customised order processing & stock inventory. Imperative: highly desirable, deal-maker. NV Logistics fitted the bill perfectly for all 3 imperatives and things moved forward swiftly: the commercial offer was submitted in July and signed only a few weeks later! The contractual conclusion was straightforward because we were able to demonstrate high performance in all areas imperative to Aptissen. In addition, we earned the trust of Aptissen’s auditors from SGS whom we met on location and for whom we reserved quality time for expert discussions.. Newly restored and spacious warehouse in Meyrin-Geneva with temperate-controlled rooms at between +2º and +25° C.
Swissmedic certified storage services, guaranteed under Swissmedic Wholeseller Authorization 1009990. Customised order processing & stock inventory solutions whose processes NV Logistics owns and is able to customise, to fulfil Aptissen’s unique specifications. The moral of the story: busy clients appreciate a competent and certified supplier with a capacity for holistic services..
We believe that Aptissen’s needs for integrated services – which include certified storage facilities and ERP based processing systems – are fairly typical in the biotech, medical and pharmaceutical landscapes. We are grateful to Aptissen who agreed to let us publish this Case Study, giving us the opportunity to unveil insights about our holistic, modern-day warehouse offering. Our contract with Aptissen englobes the following fully integrated services. Aptissen needs storage for its medical devices and other diverse materials (packaging and marketing). Required storage temperature for medical devices: +2° and +25° C.
NV Logistics stores Aptissen’s products at its facility at Geneva-Meyrin, Switzerland. Invoice agreement with Aptissen: based on pallet units per month. Pallet size = 120x080x120 cm. A close and trusting customer relationship is an essential component of our business approach. Upon signature of the contract, we immediately allocated a competent and motivated resource to the Aptissen account. For the sake of this case study, let’s call him Mr. NV. This person is fully trained to use NV Logistics’ customisable ERP* software. NV Logistics owns the necessary technical resources to provide optimised processes, based on each client’s specific needs. Section 1 outlines the Order Processing flow, put in place for Aptissen. Section 2 describes what happens with Inventory Management at ERP software level. Section 1. Order Processing Flow. 1. Receives merchandise from Aptissen’s suppliers. 2. Fulfils orders and prepares merchandise to Aptissen’s clients. Creates a “Goods Receipt Document” and establishes a “Reception report”. This report informs about quantity received and potential damage to packaging, validating the accompanying paperwork. Unloads the merchandise into the warehouse’s Quarantine area (temperature controlled). → Release request approved: moves goods to definite storage area. → Release request rejected: prepares and executes the return of the goods to the supplier. We describe the ERP side of things in Section 2. Based on Aptissen’s instructions, he prepares the order (turnaround = max. 1 working day). Communicates the pack’s weight and size to Aptissen so that they may prepare relevant paperwork (before 12h00) for the carrier. NB: Aptissen are free to choose their courier. Collects relevant original shipping paperwork from Aptissen’s headquarters in Plan-les-Ouates. As of 16h00, the order is ready (at NV Logistic’s warehouse) to be collected by the Aptissen designated carrier. Client returns are placed into the warehouse’s temporary Quarantine area (temperature controlled). Based on Aptissen’s instructions, he returns the goods or moves them back into the definite storage area. Section 2. Inventory Management ERP. Client Bonus: A detailed trace of a product’s inventory journey is available for online consultation by the client at all times. Incoming products are immediately placed into the temperature-controlled Quarantine area and entered into the inventory system, labelled “Quarantine”. ERP System process: the software creates a database record with a unique ID key which is completed by the manual entry of other identifying elements such as product reference, batch number, quantity, description. Products in the Quarantine area are not available for “picking” (order fulfilment) before “release”. “Release” is the approval given by Aptissen to move merchandise into the definite storage area, ready for order fulfilment. ERP System process: once released, the database record is updated manually and the stock inventory is updated automatically. Aptissen’s order fulfilment instructions include product reference, batch number, quantity, and the packaging person’s ID. 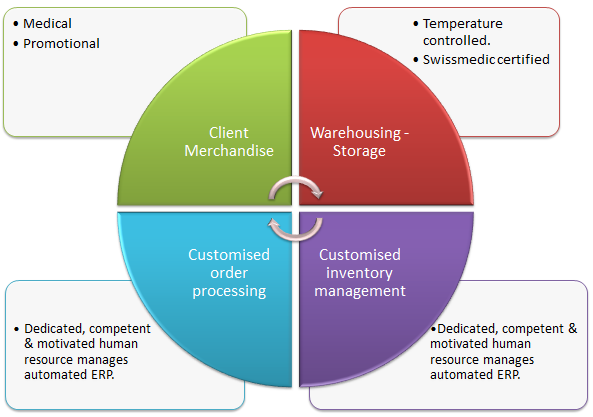 ERP System process: Only “released” merchandise is available for order fulfilment. Only non-used merchandise is returned to NV Logistics. ERP System process: if merchandise is once more released, the relevant database record is manually modified and the stock inventory updated automatically. Bonus: Clients may punctually request targeted reports, providing them with useful statistical insights drawn from the ERP’s meticulously maintained and updated database. NV Logistics’ fully integrated services increasingly seduce and convince pharma, biotech and med tech companies in Switzerland. 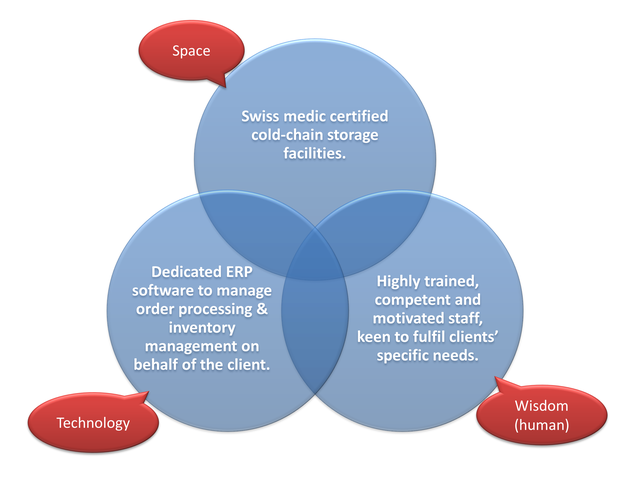 The integrated, triangular approach brings together Swissmedic certified storage facilities, dedicated ERP software for customisable order processing & inventory management as well as highly trained, competent and motivated staff.